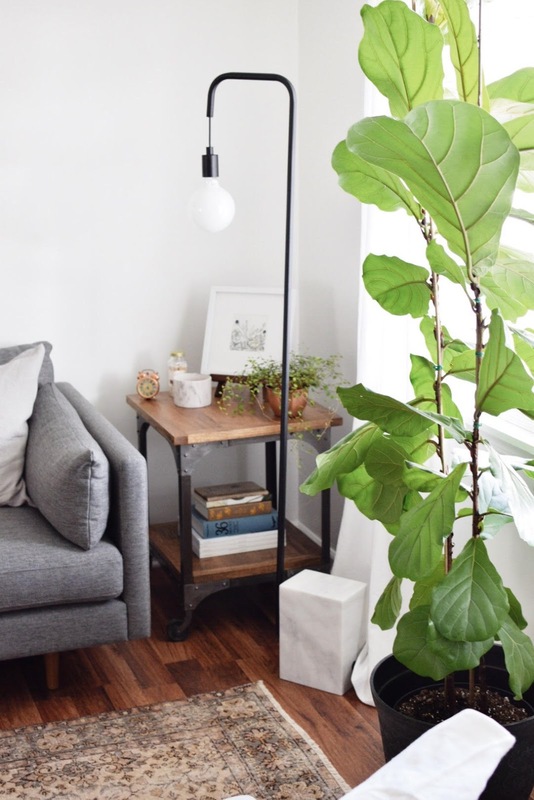 I have been wanting to blog about houseplants for a long time now and am finally getting around to it! I am often asked about plants and what are my favorites and how to care for them. Anything that I can share has been strictly from trial and error and finding what works best for my space. Obviously, each home is different considering lighting conditions so you may just have to try out a few before you find your personal favorite. Fortunately, small houseplants are relatively cheap so just start out small and try your hand at a few. I love the warmth that plants can bring to a home. They instantly give life and color to a space. Just recently, I felt like my bedroom was feeling a little "too white" and I wanted something to warm up the space. I added a couple new plants and they immediately made it feel homier. I purchased this big guy a couple years ago when he was a baby. I actually ordered him through the mail because I couldn't find any in our area. Fiddle Leafs can be a little fickle I've heard but mine has always down well for me. A few tips I would say are to keep it near a window with direct light, water it once a week (only once the soil feels dry), and try not to move it around much. It likes to stay in a stationary place and does not take to interchanging light conditions.